After several months of waiting, finally ordered to Nashville Tennessee for indoctrination consisting of IQ tests, dexterity tests, physical conditioning and more physical conditioning. Next it was Maxwell Field Alabama where you were entered in the program and in the Army, more testing, learning the Army way (drill, weapons, regulations) and ground school. Very intense and with a military academy atmosphere, this was 4 to 6 weeks if I remember. Basic training follows and you are back in the Army with all its disciplines. Basic trainers are BT-13's and you have many more skills to learn which includes cross country, night flying, some aerobatics, etc. and more terrifying check rides. You fly about 75 HRS here and if you complete this 9 weeks you are off to advanced school. Advance the training is in an AT-6 which has a great airplane capable of doing about everything, so it's more skills to learn and by now you are almost a qualified pilot. 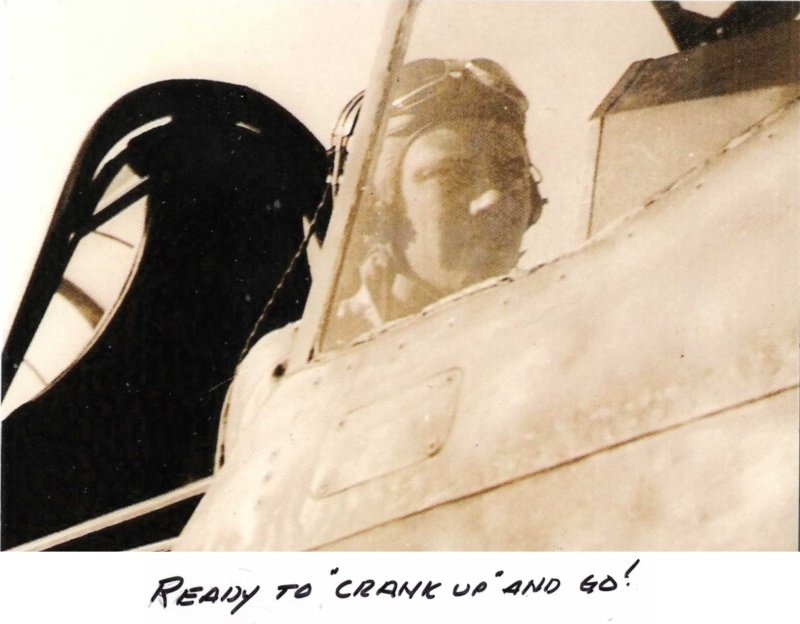 Now it is formation flying, aerial, ground gunnery, aerobatics, and less fear of a check rides. As you approach completion of your training you are asked to select your choice of fighters, bombers, or other types. You hope to get what you select and it is here that you fly your first fighter aircraft and in my case a P-40, what a thrill! 600 HP to 1200 HP, wow! Now, many years later, you realize everything being equal, short guys went to fighters and tall guys to bombers. 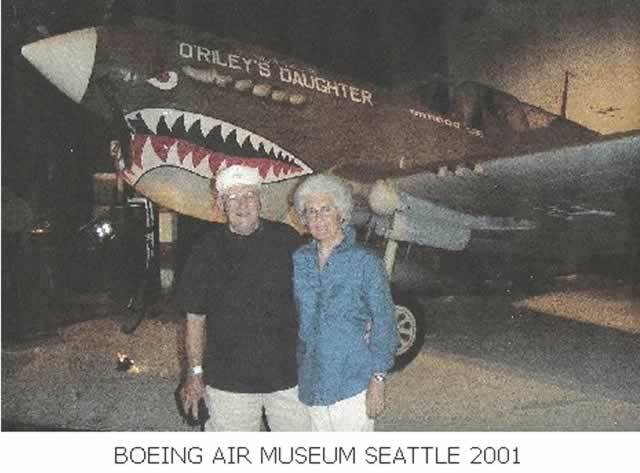 I graduated in the class of 43F (June, 1943) from Craig Field Alabama and with 7 ½ hours P-40 time I was sent to the 30th Fighter Squadron, 57th Fighter Group, 6th Air Force, Panama where I flew P-40s, B's and C's. 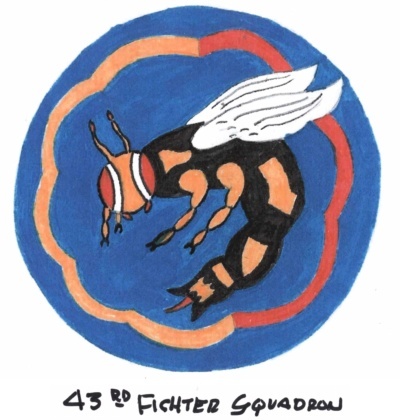 Upon completion of 35 flying hours I was assigned to a tactical fighter squadron, the 43rd, 16th Fighter Group, 26th Fighter Command, 6th Air Force, and remaining there some 700 hours later until May, 1945. 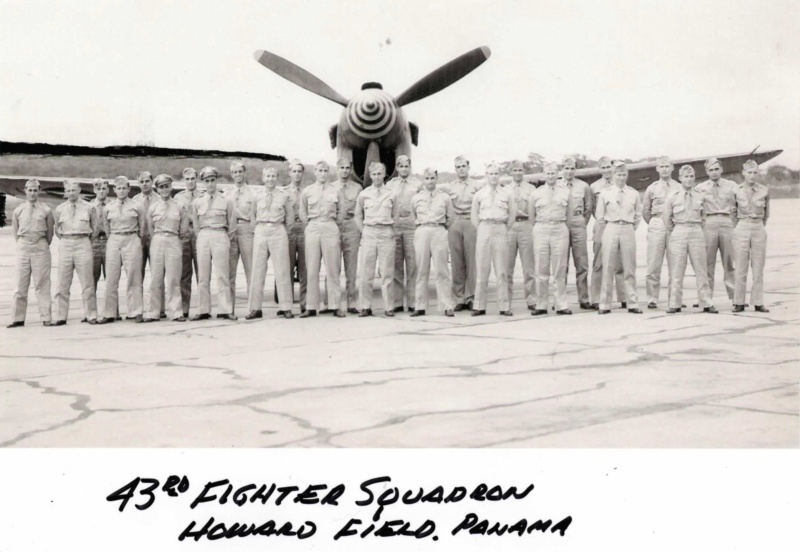 When I arrived in Panama after graduating as a 2nd Lieutenant from flying school in June of 1943, I realized the Panama Canal was a prime target for the enemy, it was protected by a four fighter squadron flying P-39's , barrage balloons, and elements of the U.S. Navy. Everything entering the canal zone was intercepted, identified, and reported to central command. It was in this environment that I reported to the 30th Fighter Squadron at Aguadulce (60 miles southwest of Panama City) for more training in fighters (I had 7 ½ hours in flying school) and to become proficient enough to be assigned to a tactical unit. 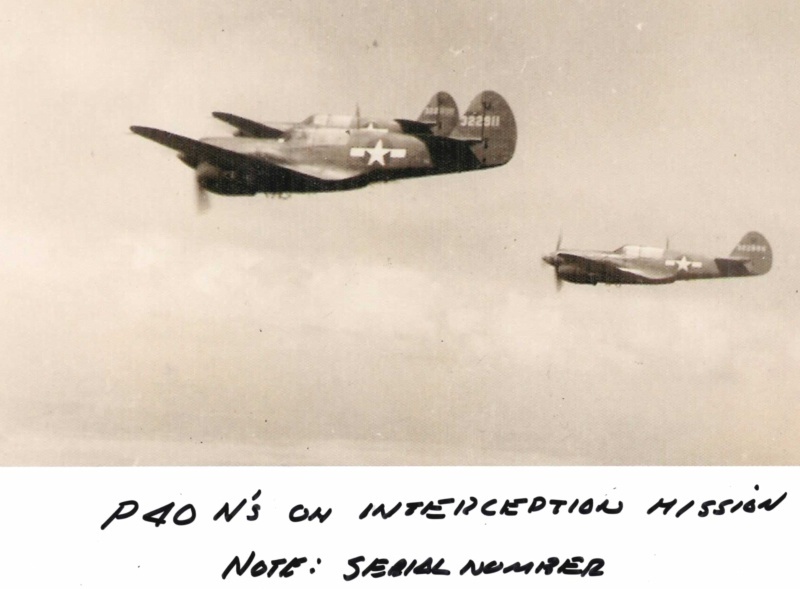 The 30th flew P-40B's and C's but all the tactical squadron flew P-39's. 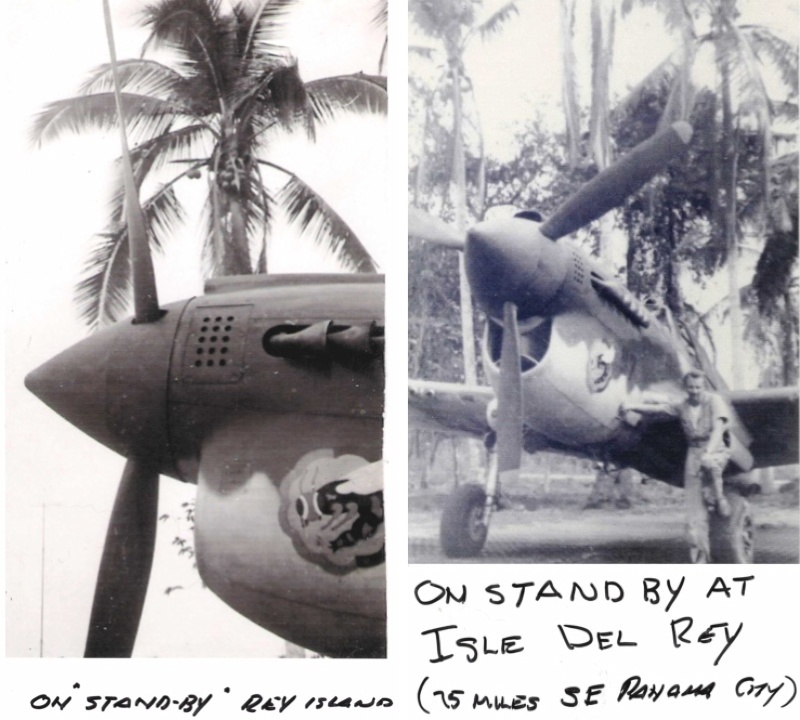 Thirty days later I joined the 43rd Fighter Squadron at the fighter strip just on the edge of the jungle at a place called La Joya, east of Panama City. 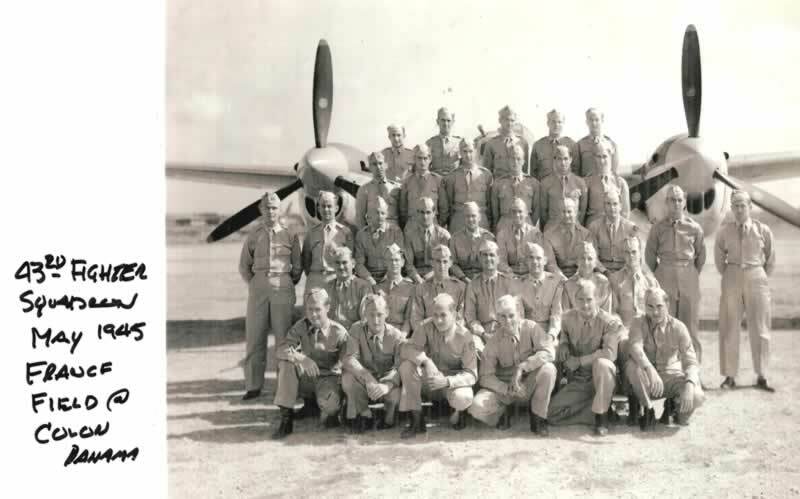 As stated, the 43rd flew P-39's and in addition to interceptions it flew training missions consisting of aerial and ground gunnery, formation maneuvers, and tactics. It is well known that the P-39 in spite of its good looks was not a good flying aircraft. The weighting was improper and the plane had a tendency to go into high speed stalls which could and up in a flat spin or tumble.  In an effort to correct these flying characteristics, the 37mm cannon was removed among other things. In the end, the airplane was redlined at a lower air speed with a minimum of firepower thus becoming ineffective as a fighter (half of the P-39's built were "lend-leased" to the Russians who thought they were great). In November, our squadron was assigned P-40N-5's and it was goodbye to the 39's. As time passed, the threat to the canal lessened and squadrons were reassigned out of the area leaving the 24th and 43rd and continue the mission. At the same time we were relocated to La Cherrera, a dirt fighter strip just west of the city. We continued with the interceptions, but no new pilots were being assigned to us for fighter training before they were sent into combat. The P-40N's were a stable, effective fighter below 15,000ft.. I believe they were the last model mass produced and engineer's did all they could to reduce weight and wing loading including removing starters so that the airplane had to be hand cranked by the ground crew. In a contest with a fellow pilot, the highest I could coach the plane to was 27,500ft.. and so much as the P-39's and P-40's were all we had operational at the beginning of the war, they did a magnificent job, only with the introduction of the supercharger and the ability to fly much higher were they superseded. The Merlin engine in the P-51, the placement of the supercharger in the rear of the P-47 and the P-38's twin engines allowed the supercharged planes to fly higher and faster, yet below 15,000ft. the P-40 could hold its own with any of them. The 43rd move twice before I was ordered back to the States for R&R and reassignment. They moved first to Howard Field on the Pacific side and then to France Field at Colon. April of 1945 we received our first P-38 and the P-40's were on their way out. I checked out in the P-38 prior to departing the squadron after some 19 months and over 700 hours fighter time. The war in Europe ended in May 1945 and the Air Corp immediately had a surplus of pilots. At R&R in Santa Monica and just short of the 83 points needed for discharge, I opted to go to a fighter base just outside Las Vegas and fly "pinball machines". Now just what is a "pinball machine"? Well, it is an armor plated P-63 used to make passes at B-24's flying out of Nellis Air Base who are training aerial gunners. They fired plastic bullets at the fighters and if they scored hits a counter in the fighter cockpit recorded them and a light mounted in the nose cone flashed red, hence, "pinball machines". The problem was that the armor did not protect the radiators and a hit there caused the coolant to leak out and the engine to freeze. I am familiar with this because it happened to me requiring a wheels up a landing in a dry lake which fortunately just happened to be in the right spot at the right time. Shortly after this experience, the program was discontinued. I was stationed for about a month at Indian Springs Airfield and the highlight was flying the big brother of the "Airacobra", the "King Cobra", the P-63 (not the armor plated version). Everything wrong with the P-39 had been corrected and the P-63 was a fine airplane, however, it came online too late and never really was needed. Now it was the development of jet fighters. In September of 1945, I was separated from the Air Corp at Fort Lewis Washington and thus ended, for the most part, my flying days. It had been "one hell of a ride"!